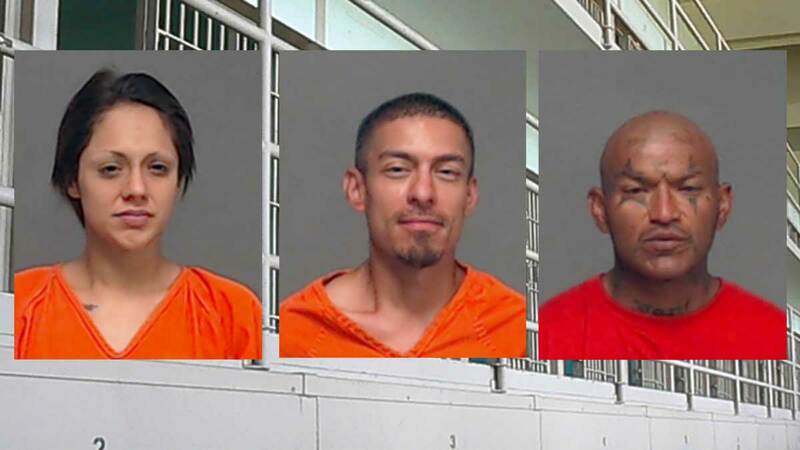 SAN ANGELO, TX -- Forty suspects were arrested and booked into the Tom Green County Jail over the weekend. The Tom Green County Sheriff's Office, the San Angelo Police Department and the Texas Department of Public Safety made various arrests including multiple thefts, driving while intoxicated, and an indictment for sexual assault of a child. Out of the 445 beds, 391 of them are occupied as of Monday morning. Matthew Autry was arrested for possession of marijuana at 3:20 a.m. His bond was set at $1,000. Aaron Nitcsch was arrested for assault by contact to a family member at 3:43 a.m. His bond is set at $1,556. Robert Rodriguez was arrested for criminal trespassing at 10:15 a.m. His bond was set at $500 and was released at 3:58 p.m.
Jarrod Clark was arrested for J/N possession of marijuana at 10:20 a.m. His bond was set at $1,000. Brianna Obryan was arrested for driving while license invalid, three FTA, and no liability insurance at 10:47 a.m. Her bond was set at $2,764 and was released at 5:58 p.m.
John Gilmour was arrested for MTR assault to family member by impeding breath or circulation at 10:15 a.m. His bond has not been set at this time. Victoria Aguirre was arrested for driving while license invalid and FTA at 11:17 a.m. Her bond was set at $2,336 and was released at 3:43 p.m.
Magen Deeds was arrested for a MISC CPF at 11:44 a.m. Her bond has not been set at this time. Andrew Barrientos was arrested for MTR possession of a controlled substance, driving while license invalid, and speeding at 1:57 p.m. His bond was set at $2,754 and was released Saturday at 1:57 p.m.
Daniel Sanchez was arrested for COMM his second driving while intoxicated at 2:25 p.m. His bond has not been set at this time. Brian Frazier was arrested for driving while license invalid and possession of drug paraphernalia at 3:01 p.m. His bond was set at $1,376 and was released Saturday at 12:13 a.m.
Jonathan Harlin was arrested for accident involving damage to a vehicle at 3:55 p.m. He was released without bond at 5:28 p.m.
Warran Clark was arrested for driving while license invalid at 6:20 p.m. His bond was set at $450 and was released Saturday at 2:13 a.m.
Roy Ownes was arrested for driving while intoxicated with a BAC over .15 at 7:06 p.m. His bond was set at $1,500 and was released Saturday at 12:13 a.m.
Victoria Estrada was arrested for public intoxicated at 7:35 p.m. Her bond is set at $442. Colt Barrientes was arrested for J/N abandoning or endangering a child by criminal neglect at 8:44 p.m. His bond is set at $20,000. Olen Ferguson was arrested for class c theft, possession of marijuana, driving while license invalid, and speeding at 9:11 p.m. His bond was set at $5,234 and was released Saturday at 12:13 a.m.
Bobby Banda was arrested for possession of marijuana, MTR possession of a controlled substance, and unauthorized absence from a community correctional facility at 9:15 p.m. His bond is set at $1,000. Leif Scobie was arrested for theft of a property at 10:42 p.m. His bond is set at $500. Nancy Ramirez was arrested for possession of marijuana and possession of a controlled substance at 1:20 a.m. Her bond was set at $8,500 and was released at 1:28 p.m.
Martin Martinez-Lopez was arrested for public intoxication at 3:36 a.m. His bond was set at $442 and was released at 2:28 p.m.
Stephen Friend was arrested for possession of drug paraphernalia, 10 MISC CPF, and one FTA at 5:08 a.m. His bond was set at $1,124. Cody Clark was arrested for driving while license invalid and a MISC FTA at 4:18 p.m. His bond was set at $1,148 and was released at 7:28 p.m.
Ashton Pagano was arrested for reckless driving at 8:27 p.m. His bond was set at $500 and was released at 10:13 p.m.
Freddie Cabrera was arrested for possession of marijuana at 9:12 p.m. His bond was set at $1,000 and was released at 10:13 p.m.
Natalie Bartlett was arrested for assault that caused bodily injury to a family member at 11:35 p.m. Her bond was set at $3,500 and was released Sunday at 12:58 p.m.
Gustavo Hernandez was arrested for two FTA at 12:40 a.m. His bond was set at $908 and was released at 5:43 a.m.
Rodney Villafranco was arrested for eight MISC CPF at 4:26 a.m. His bond is set at $482. Chriselda Esquivel was arrested for impeding traffic at 8:21 a.m. Her bond was set at $354 abd was released at 12:13 p.m.
Michael Carrasco was arrested for theft of a property and criminal trespassing at 8:48 a.m. His bond is set at $500. Jonathan Borrego was arrested for criminal trespassing at 8:55 a.m., His bond was set at $500 and was released at 10:28 p.m.
Kelsea Perez was arrested for criminal trespassing at 9:01 a.m. Her bond was set at $500 and was released at 2:43 p.m.
Mariso Baron was being held for ICE starting at 10:08 a.m. He was released Saturday at 8:43 a.m.
Louis Ramos was arrested for theft of a property with a previous conviction and possession of drug paraphernalia at 12:15 p.m. His bond is set at $1,642. Ashton Locke was arrested for two counts of GJI sexual assault of a child at 1:54 p.m. His bond has not been set at this time. Brandon Cook was arrested for one FTA at 2:22 p.m. He was released without bond at 4:43 p.m.
John Ayala was arrested for burglary of a habitation, possession of marijuana, evading arrest, and failure to identify as a fugitive from justice at 2:36 p.m. His bond is set at $2,000. Jeremiah Wilson was arrested for VOP possession of marijuana, possession of a controlled substance, and failure to identify as a fugitive from justice at 3:13 p.m. His bond is set at $10,500. Kaylee Perez was arrested for class C theft, possession of drug paraphernalia, criminal trespassing, and failure to identify as a fugitive from justice at 3:27 p.m. Her bond is set at $3,230. Anthony McCarthy was arrested for public intoxication at 7:27 p.m. His bond was set at $1,464 and was released Monday at 7:43 a.m.